Keep the best parts while trimming substantial amounts of droid slapstick, exposition, and bloated editing. Shift Anakin’s fall to the dark side away from Padmé, and toward Palpatine. Learn from existing edits, use the best of their ideas, and fine-tune each and every scene. Make as seamless and professional an edit as possible. So many fan edits have great ideas, but you can tell if the music is a little uneven, or if the rhythm of a sequence gets off balance. I wanted to create a version that you could watch without knowing anything changed. If an edit, however ideal, resulted in a noticeable glitch, it had to go. This project began as a modification of Hal9000’s “Labyrinth of Evil” edit, but its scope expanded quickly. At first I meant only to re-insert the Yoda/Palpatine fight. Then I began replacing every shot with the raw blu ray source, which looked a lot better than the HDTV source Hal9000 used. Bit by bit it became its own entity. I loved Hal9000’s brilliant re-edit of the elevator/Artoo/Anakin-and-Obi-Wan-get-captured sequence near the beginning of the film. I’ve extended the Artoo shot and removed the lightning zap, so now it feels better. I tried my best to keep as much of the original flow as I could. When Anakin is brooding in the council chamber, we get some on-the-nose Palpatine whispers. Instead of cutting the shot completely to remove Palpatine’s voice, I used the soundtrack to fill in the gap, keeping the scene intact. Another example is the introduction of Obi-Wan’s lizard on Utapau. Instead of cutting the entire introduction sequence, which included an establishing shot of the upper level, I trimmed the absurd 360-panning shot of Obi-Wan riding the lizard. I’d like to think that this edit is a balance between the best of community fan edit ideas and the goal of only changing what can be fixed without drawing attention to itself. Ideally all changes are invisible. There are three versions: A 10GB 1080p/5.1 MKV, a 31GB 1080p/5.1 MKV, and a fully functional 34GB blu ray disk with menus. The Blu Ray also features a 100% rebuilt intro based off the 2005 DVDs. Unfortunately I don’t have time to do subtitles for the full edit, so there are none. Apologies to anyone hard-of-hearing. More details to be posted on Fanedit.org once it goes through the IFDB process. Edit by Noah Bronstein aka Siliconmaster. Additional VFX by Adam Burrows. Design and 3d Support by Alex Campuzano. Special thanks to Kate Bronstein, my lovely wife who put up with this project for 9 months. Additional thanks to Ifadufadi, Sean Giblin, and Nick Mangieri, who served as my Editing Council to give advice on various changes. Thanks to Hal9000, JasonN, L8wrtr, Q2, AEMovieGuy, Corigar, Kerr, ADigitalMan, Slumberland, Stankpac, TM2YC, Spence, Father Merrin, Sithlord, and The Cutter. Without their ideas and fan edits over the years, I never would have been able to tackle this project. Thanks especially to Hal9000’s commentary track, which discussed the fan editing community and their ideal versions of a lot of the scenes. Sources: Revenge of the Sith Blu Ray, Hal9000’s “Labyrinth of Evil”, Revenge of the Sith soundtrack. Edited with Premiere, After Effects, and Audition. Blu Ray Menus made in Cinema 4D with Corona renderer. Nearly every scene has been reworked in some fashion if it was possible without being obvious. The following are all the changes I can remember now, but there are probably quite a few subtle ones that slipped through the cracks. Original film name and opening crawl. Removed Grievous coughing as much as possible. Buzz droid sequence trimmed to keep things moving more quickly. Some additional dialogue bits removed that seemed superfluous. Dialogue between Obi-Wan and Anakin adjusted where possible to make it more of an equal relationship- Obi-Wan trusts Anakin’s instincts (most of the time). Obi-Wan’s acrobatics trimmed during the landing scene on Grievous’s ship. Dialogue and action trims as they prepare to find Palpatine. Some dialogue trims before and during the Dooku fight. Anakin barely hesitates when killing Dooku. It should be impulsive, representative of Anakin’s inner feelings. The moment he stops and ponders what he should do you lose that momentum. Added a muffled explosion sound to improve the transition between space battle and the close up on the elevator buttons. Hal9000’s brilliant switch-up of the scene where Obi-Wan, Anakin, and Palpatine get captured has been reworked with some additional VFX to make it work better. Nearly the entire elevator sequence is gone. Droidless audio used from Hal9000’s edit (and originally taken from L8wrtr’s) since it worked so well. In the same sequence, Grievous says his one liner about abandoning ship as he throws his spear through the window, rather than later to himself. Kept Obi-Wan and Anakin talking about old adventures- we need to see how well they get along before their friendship disintegrates. Anakin’s conversation with Padmé adjusted so he doesn’t seem oddly unhappy when he hears of her pregnancy. Grievous Utapau arrival scene moved later, taking cues from Hal9000’s edit. Deleted scene with Obi-Wan, Windu, and Yoda (thanks to Hal9000 for his upscale) inserted before the council scene so that we go into it with some idea of what’s going on behind the scenes. Council scene re-edited to turn Anakin from a whining brat to someone genuinely taken aback by the Council. It should appear he oversteps, then quickly realizes his mistake and backs down, still to Obi-Wan’s disapproval. 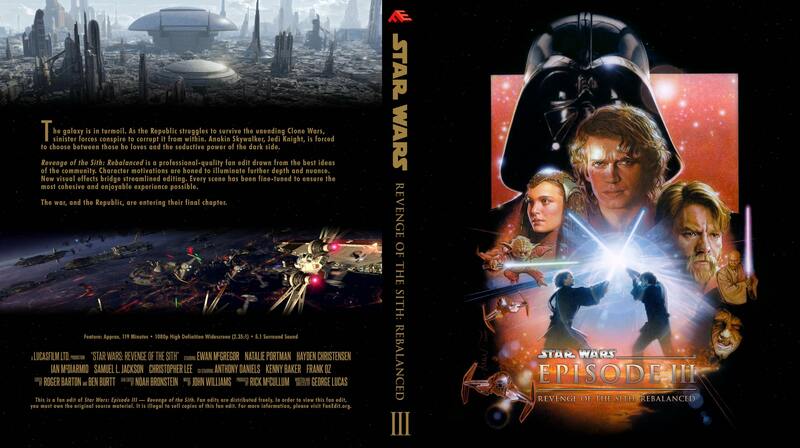 All mentions of the Prophecy and Anakin being the Chosen One have been removed as carefully as possible, leaving scenes like “Anakin didn’t take well to his new assignment” with Yoda, Mace, and Obi-Wan intact. Only the first nightmare kept, taking cues from Hal9000’s edit. Instead of talking to Padmé afterward, Anakin goes to speak with Palpatine. Shows his leanings even this early in the film. 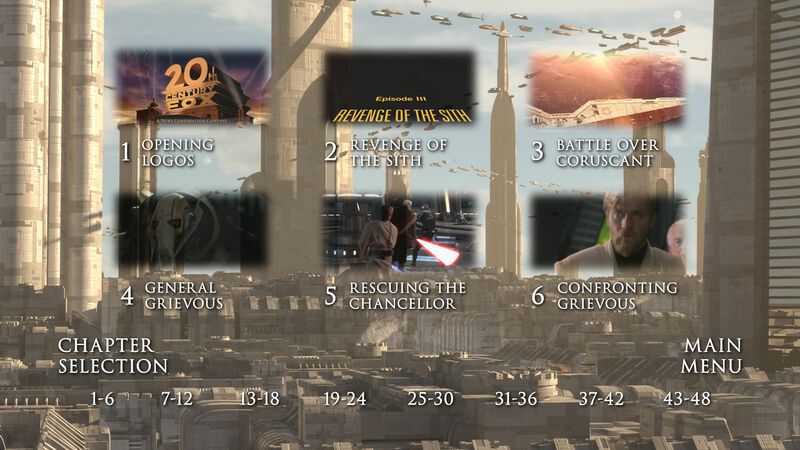 While the Seeds of the Rebellion deleted scenes were initially included, it slowed down the pacing too much and they were removed again. Anakin and Padmé’s “I’m not the Jedi I should be” scene partially re-inserted to fill the gap between Obi-Wan leaving for Utapau and arriving from hyperspace. The opening nightmare is replaced by a reversed establishing shot from Attack of the Clones. Ending trimmed to remove lines about Anakin saving Padmé. Trimmed multiple shots throughout film where there was nothing happening for a while. Examples are the awkward start to the scene with Anakin and Padmé sitting in her apartment, and the ridiculously long shot of Anakin strolling into the battle between Mace and Palpatine. Trimmed Lizard reveal on Utapau enough to make it useful but not so much that you lose the establishing shot for the Separatist leader hideout. Grievous runs away rather than losing entirely to Obi-Wan, matching his cowardly character. Fixed Obi-Wan visibly falling on mats before his hand grabs the ledge. Similar change to Hal9000’s, but with additional VFX tweaks. Removed Palpatine speaking during the scene where Anakin broods in the Council chambers. Used soundtrack music to bridge the hole to keep the same cuts. Palpatine still flips over his desk because he should be weird and alien and insane looking. While I really liked Hal9000’s approach to Palpatine’s transfiguration, I tried a few variations to make it less abrupt. We even tried a new VFX shot of his face transforming. Unfortunately I couldn’t quite make this one work inside my goal of seamless edits. Instead, I went with a heavily edited version of the original scene. I substantially reworked it to support Anakin’s genuine belief that Palpatine needs a trial and that Windu might just be going off the deep end. Anakin’s final act is still of selfishness, but his motivations ring more true than just needing Palpatine for his power. Ideally, this scene and its aftermath result in Anakin becoming Vader in name only. It isn’t so sudden because he himself doesn’t really feel the name is important. Only as he succumbs to his power trip does he fully embrace it, giving it meaning. Palpatine no longer mentions Padmé when telling Anakin he is almost strong enough. Anakin no longer kills younglings on-screen, so that his scene with Padmé afterward is plausibly believable and not terrifyingly psychopathic. The holograms later still show him killing older padawans, but it could be seen as him defending himself if they attacked in response to him hunting down their masters. Exchange between Obi-Wan and Yoda in the temple has been adjusted so that Yoda does not order Obi-Wan to kill Anakin, leaving some element of hope. Conversation between Obi-Wan and Padmé about Anakin NOT changed from the original, as much as I would have liked to. The music was just too obvious when I tried it. Adjusted reunion between Anakin and Padmé to remove useless dialogue and focus on what matters. Anakin no longer makes a big deal out of saving Padmé since that was not his primary motivation. “High ground” and “You were the chosen one” removed from the end of their fight. Removed “Noooooo” scene entirely. The final shot of Vader that we need is his helmet lowering onto his face. Padmé still dies (it’s a stupid plot point but I didn’t feel the scenes from The Other Boleyn Girl fit in enough to make it work here). Yoda now goes off to Dagobah before the funeral, but after helping Obi-Wan and Bail Organa deliver her body to Naboo. Jar Jar removed from Funeral Scene. Credits added for myself, those who helped me, and the fan editors credited in “Labyrinth of Evil” plus Hal9000 of course. I left out those credited directly on “Labyrinth of Evil” because those were specifically for people who did VFX and audio work on that edit. Audio tweaks to Padmé/Anakin scene post crash landing. Adjusted audio in council scene to fix ambience dropping out. Rebuilt 5.1 foley to replace the “Charge!” line from the droid on Kashyyyk. Tweaked “Are you threatening me, Master Jedi?” audio cut to be less obvious. Reduced audio overlap of blaster bolts at youngling removal cut. Tweaked music edit at Yoda’s “I agree” line to be less obvious. Hunted down and exterminated all audio pops scene by scene. Fixed end credits jittering as well as a flash frame right as they start. Added a fun surprise at the very end. Adjusted blu ray menu looping. 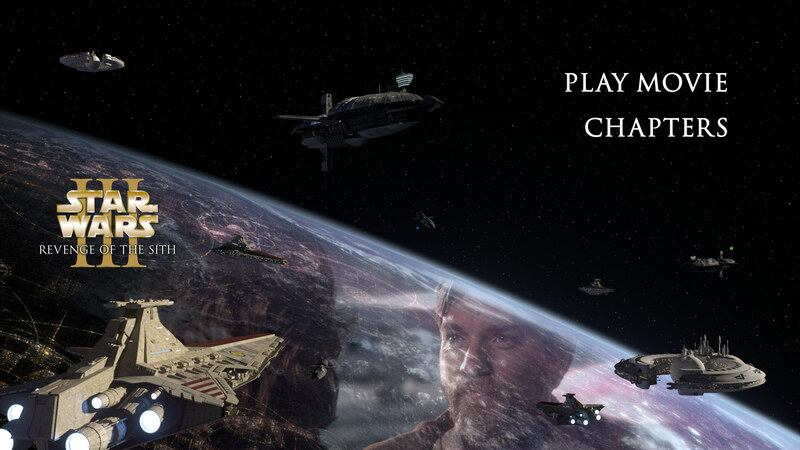 Added a fade to the text during the blu ray main menu --> chapter menu transition. Removed a stray audio clip from the council scene around 36:12. Only the MKV versions were affected. Removed the final shot of Anakin, Obi-Wan, and Palpatine hanging in the elevator at the Artoo sequence because it was too obviously slowed down. Added a music cue to help sell the moment. Escape pod scene audio transition fixed. Adjusted audio edit during Anakin’s reunion with Padmé. Major music change at the transition from Padmé and Anakin to the Jedi Temple. Adjusted audio transition from Obi-Wan leaving Coruscant to Anakin brooding. Tweaked audio transition from Padmé and Anakin to Grievous’s ship. I received reports of people unable to extract the Blu Ray ISO, so I re-uploaded it. In addition, the 30 GB files are now split into 3 pieces each to make things easier for viewers. I also now have a 10 GB version of the MKV for those who don’t need or can’t download the full 30 GB edition. All files are confirmed to be intact and working. Could I see both your and Hal 9000’s take on Palpatine’s facial transformation? Sure. I’ve put together a comparison of Palpatine’s transformation, between the theatrical cut, Hal9000’s “Labyrinth of Evil,” and my RotS: Rebalanced edit. The original clocks in at about 2:29, Hal’s at 1:09, and mine at 1:26. I’ve included the surrounding sequence because so much of the scene relies on the motivations of the characters involved. Hal went for a dramatic edit to emphasize Palpatine’s transformation as a deliberate and conscious choice. I really like that idea, but even after some VFX attempts to replace the cut to black in Hal’s version, I couldn’t quite get it to work the way I wanted. Instead, I tried minimizing Palpatine’s whining so that his actions have the sense of deliberation rather than frantic pleading. His second lightning attack is now just long enough to potentially cause his transformation, but short enough that he could easily be using it as a pretense for dropping his mask. I also emphasized Anakin’s dilemma as morally-based rather than Padme-focused, as much as I could. Anakin still believes that Palpatine should stand trial, and Windu charging in and preparing to execute the Chancellor is exactly the knife edge that Anakin’s character needs to tip over. Instead of keeping Palpatine alive merely to save Padme, he does it out of loyalty to what he sees as the Republic. And of course as we know all too well, it’s the wrong choice. I liked them but I can’t help but think that Sidious is having a pre-mature ejac each time he finishes with Windu. 😛. Just to reiterate: “my” version of the Palpatine scene is extremely similar to L8wrtr’s (at least the transformation itself), which was in turn a variation of Kerr’s. Good to know. It was hard to keep track of just how many community revisions the idea had gone through! Either way it’s a cool concept, and I did my best to honor it through more traditional editing techniques. The edit is very professional feeling as Siliconmaster claims, at least for my eyes. I didn’t notice any rough cuts and you notice something was missing form theatrical cut only if you stop to think about it. And how the Jedi get caught on the Invisible Hand is absolutely the way to go! Gets rid of the ray ”plot device” shield. The Palpatine speaking during the scene where Anakin broods before turning has never bothered me but the scene is a bit more atmospheric without the voiceover and just the music playing. I would have liked to see more silly droid sounds removed like when Obi & Anakin enter the Invisible Hand and fight the first battle droids, that was great. But maybe that would have broken the seamless flow Siliconmaster was aiming for. And i dislike the buzz droids since they only pop up in this scene and are not seen in any other movies. I have always disliked the Ep 3’s ”hold the viewers hand to Ep 4”-ending as if every piece fell into its place on the same day for Ep 4 and then nothing happens in 20 years in between. Some things can be left to imagination. Unfortunately this edit does not fix those issues for me and even ads one (Dagobah). I would like to see at least the ”Vader looking at Deathstar”- scene go as it just oozes unnecessary fan service out of every crack. But I understand this depends on your personal taste. As I like a more radical edit, I’m not sure why Siliconmaster chose to revert back to ”Padme dying in birth” like in the original cut, didn’t Hal9000’s edit use The Other boylean girl- clip to make her survive? Maybe it was some other edit, not sure. All in all a very good solid edit, although I prefer a more radical cut of the film. Thanks for your review Dazman! I would have liked to see more silly droid sounds removed like when Obi & Anakin enter the Invisible Hand and fight the first battle droids, that was great. But maybe that would have broken the seamless flow Siliconmaster was aiming for. If it’s the scene where they land in the hanger, there is already some alternate audio in there from other editors to remove as many of the droid voices as possible. I’m not a fan of them either. I have always disliked the Ep 3’s ”hold the viewers hand to Ep 4”-ending as if every piece fell into its place on the same day for Ep 4 and then nothing happens in 20 years in between. Some things can be left to imagination. Unfortunately this edit does not fix those issues for me and even adds one (Dagobah). I would like to see at least the ”Vader looking at Deathstar”- scene go as it just oozes unnecessary fan service out of every crack. But I understand this depends on your personal taste. As I like a more radical edit, I’m not sure why Siliconmaster chose to revert back to ”Padme dying in birth” like in the original cut, didn’t Hal9000’s edit use The Other boylean girl- clip to make her survive? Maybe it was some other edit, not sure. I understand your feelings about the connections-to-episode-IV montage. Personally I prefer to think of the shot of Vader and the Emperor as years later, a glimpse of the future. I like the idea of replacing it with Coruscant, but then having Tarkin there doesn’t make as much sense. Yoda’s scene is perhaps unnecessary, but the nuance of seeing him land made me happy as a fan. Plus I enjoy the idea of Yoda using his escape pod from Kashyyyk so as to minimize his presence. As for Padme, it was definitely Hal9000’s edit which used the Other Boleyn Girl footage. I really like that idea, but I couldn’t convince myself it wasn’t an obvious cut. In the end I went with smoothness over fixing the obviously dumb plot point. I do like Padme’s funeral however, and the tragic end cap it represents for the movie. Anakin’s necklace is a nice reminder that there is good in him, tying back to his final demise in Episode VI. I’ve uploaded the files for version 1.1, pending final approval from the IFDB academy. The OP has been updated with those changes as well. I’d love to see this! I don’t see a link anywhere, despite the comment here, and couldn’t find you through FanEdit.org. Can you point me in a direction to view this? Sith is the one film I don’t feel I have a definitive edition of yet (apart from the novelization), so it’s currently the worst of the saga in my collection. If you're going to take forever, then I'm having a hotdog! V1.3 of RotS: Rebalanced is still in the final stages of approval for the IFDB. As such there are no postings on Fanedit.org’s IFDB or the fanedit.info site yet. I believe I’ve finally managed to edit versions of the few bits that have been holding me back. Now to see if I get final approval. I will PM you a link, no worries. Same goes to anyone else who’s looking for the edit. I have a google drive folder that I update as new versions come out, hence my earlier post. I keep the same overall link so that people who’ve already asked me for the files can just open it again and get the newest version. The rendition of “Across the Stars” at the end of Episode II’s “Yoda and the Younglings” matches perfectly to the half-phrase already in this scene. As a result it sounds a thousand times better than the v1.2 version which tried to emulate Hal’s edit without success. I love that it harmonizes with the last note of the existing music. In addition, it actually supports the narrative better. Now instead of vague, gloomy transition music, the love theme crests to establish that yeah, they are doing ok as a couple at the moment. The temple shows up over a positive note. Let the brooding begin when Obi-Wan starts discussing Palpatine with Anakin. We should be just as sideswiped as he is that something is amiss. Sounds very interesting. I’ve sent you a PM (I’ll wait for v1.3). I hope you’ll make a v1.4 to reimplement the seed of rebellion scenes. They indeed damage the pace a little bit but they give more deepth to the PT as a whole. I’ve watched some parts of v1.2. Some very good ideas (I like what you’ve done with Palpy vs Mace, keeping the weirdness of Palpy’s fighting style and the melting face scene without the ridiculous “he’s the traitor! No, it’s him!”). I just wish you had alter the ending more, especially Sidious vs Yoda where you’ve kept all of it (and the dialogues here are especially very very bad). Have you tried to remove the “she’s lost the will to live” ? I don’t have an issue with Padmé dying, but the medical reason behind it is very lame (I remember someone - Q2 ? - changed it to remove this line, keeping only “we are losing her”). Many good stuff though. Great video quality. Great editing. I’m glad you liked the pieces you watched! I appreciate your feedback as well. I never minded the Yoda/Palpatine fight or dialogue so I didn’t have an issue keeping it all. As for “She’s lost the will to live,” I admittedly didn’t focus too much on it to begin with. I figured if I had to have Padmé die I’d just go with the scene as it originally flowed. Now that you mention it I don’t think it would be too difficult to remove the line, but I’ve already exported all the files and finalized the project for 1.3. Unless there’s some glaring technical issue that DigMod finds on his final pass, I won’t be making further changes. All in all though, I find the droid’s line to be more of a guess at an indeterminable problem than an absurd “medical” diagnosis. Perhaps it’s not a common theory, but among my friends it’s accepted that Palpatine is sucking out Padmé’s life force to keep Anakin alive during his transformation into Darth Vader. As such, that poor droid has no clue what’s going on haha. Removing the line gives the droid a little more plausible deniability of its ignorance, but only slightly. Conclusion: I’ll keep the line unless the opportunity to easily remove it presents itself. Escape Pod Transition: I adjusted the music so that there isn’t a half-beat lost in the mix. Artoo Sequence: I removed the final shot of Anakin, Obi-Wan, and Palpatine looking up at the droids. It wasn’t long enough and the time-remapping was too obvious.